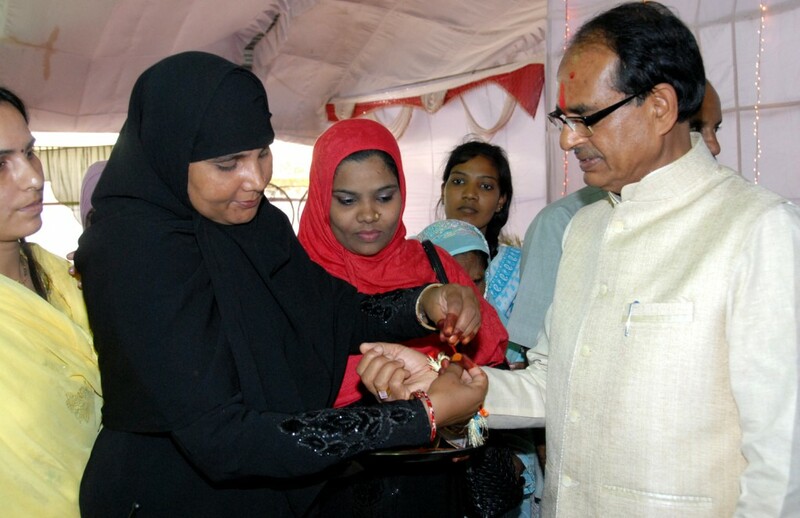 Bhopal, August 30, 2015 (Muslim Saleem): Chief Minister Mr. Shivraj Singh Chouhan has said that a campaign would be conducted throughout the state to given insurance security cover to sisters by covering them under Pradhan Mantri Jeevan Suraksha Yojana. This year’s Raksha Bandhan become very special for sisters when the Chief Minister presented them life insurance certificates as Raksha Sutra. Extending greetings of Raksha Bandhan, he said that now Raksha Bandhan has become Suraksha Bandhan for sisters. In the series of functions marking respect for all religions, Raksha Bandhan festival was celebrate with traditional gaiety at CM House today. Women from various sections of society, tied Rakhis on wrist of the Chief Minister and wished him happy and healthy life. It is noteworthy that Raksha Bandhan festival is celebrated at CM House every year. Mr. Chouhan said that the state government is ever ready to safeguard women and girls. On women’s demand, it has been decided that no new liquor shop or factory will be allowed in the state. he said that a number of measures have been adopted by the state government for education and employment of women. Now 30 percent posts have been reserved for women in police force. They have been given 50 percent reservation in local bodies. He said that it is his mission to bring smiles on faces of sisters. Representatives of all lead banks were present on the occasion to complete all formalities regarding Pradhan Mantri Jeevan Suraksha Yojana. Bhopal Mayor Mr. Alok Sharma, MLA Mr. Surendranath Singh, Municipal Corporation Chairman Mr. Surjeet Singh Chouhan and large number of sisters were present on the occasion.